Meredith says she relates to Moses not wanting to confront Pharaoh “probably because he didn’t want to come across as stupid and weak,” “to Asa, doing good stuff and being devoted for a while, and then pouting at God’s disciplinary measures when I messed up,” and to Solomon, who “was a very intellectual person.” Anonymous commenter kittyess also mentioned Solomon, but in her case it’s because he was “struggling with the apparent meaninglessness of life yet trying to find joy and contentment in life through God.” The fact that two INTPs mentioned Solomon, together with this type’s interest in digging down to the truth of the matter, is the reason I chose a quote from Ecclesiastes for this post’s title. Most of the INTPs I heard from know they have gifts. They’re just frustrated trying to use them. For Apryl, the frustration is largely rooted in gender expectations (a common problem for Thinking-type women). She writes, “While I can cook a mean casserole, I would much rather be discussing apologetics or doctrine, so the women’s duties in the church as well as women’s Bible studies are not particularly interesting or challenging to me.” Not only is she frustrated because she isn’t encouraged to use her knowledge and gifts, but she’s also frustrated because she doesn’t “have the aptitude for service or the natural gift for nurturing and comforting” that’s expected from women in her church. Ralph also mentions that he’s “considered a good teacher.” However, he adds that he is “dying a slow death” as he holds himself back from using all his gifts. In particular, he says, “I find it very hard to use my intuition in church.” He finds that people do not respond well to his ideas and insights into the “concepts and principles of in the bible” because “my ideas and my views are not of the typical Christian type” and they’re seen as impractical. 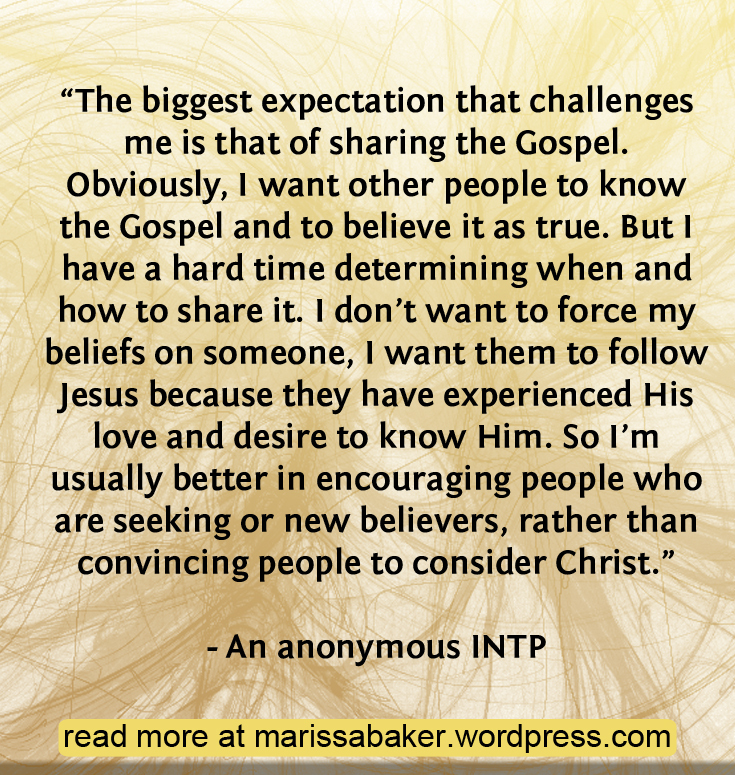 As made clear by the fact that I heard from five INTPs when writing this post and know at least three others in-person who are Christians, the INTP personality isn’t necessarily anti-religious. It does, however, seem that they are unconventional in the way they approach their faith. We touched on this when talking about their gifts and talents, but it merits a closer look. INTPs are a fairly rare personality type and on top of that they don’t tend to blend into social situations as easily as the more rare INFJs (for example). It’s very likely they’ll be misinterpreted and stand-out among their fellow believers. This can frustrate the people around them as well as the INTPs. The expectation to socialize is hard on Ralph as well. He’s a teacher in his local church and part of the international apostolic network, yet struggles with expectations that go along with those roles. He writes, “People expect me to feel something in worship, get excited by examples and testimonies, [and] spend time with as many people as possible after church so nobody feels neglected.” But those things don’t come naturally to him. 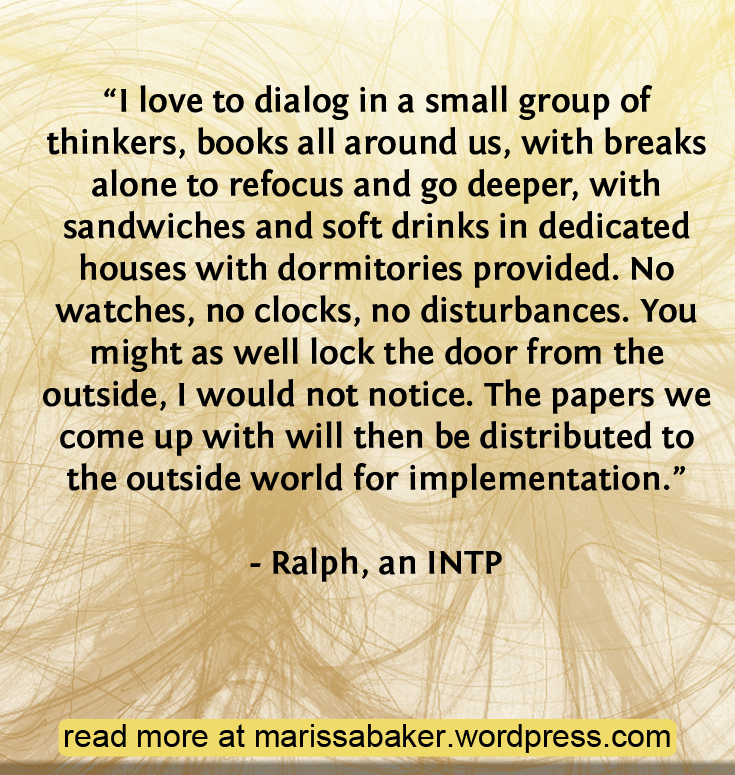 Ralph also said the church today doesn’t seem to be for people of his personality type. He says “The church today is for extroverts, as it focuses on meetings.” It’s also “sensory, as 75% of the people will not understand principles or concepts and need examples, need to be shown down to walking them through.” And it is “feeling, as experience is valued higher than knowing. Yet still, the church is not relational, as we are superficial and private.” No wonder INTPs find their experiences in today’s churches frustrating. 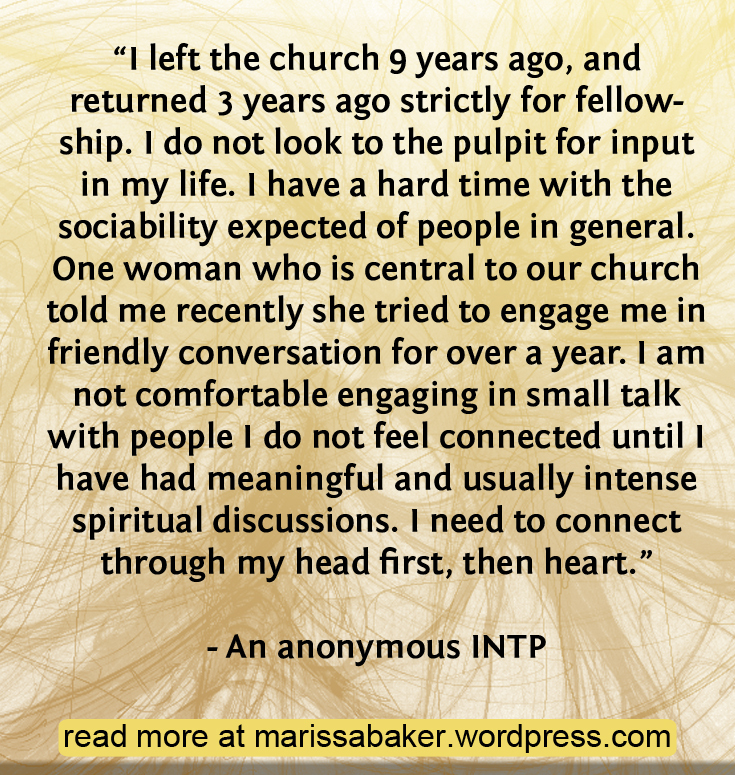 Though all the INTPs who commented expressed frustrations with connecting to other Christians, they aren’t all dissatisfied with their churches. In fact, two said they’re very happy with their current congregations. So what are these two churches doing right that catches the attention of an INTP type? It’s not that every church who wants to connect with INTPs should do go out an hire an INTP pastor, though. Like most of us, INTPs are simply looking for people who speak their language. They’re hungry for information and they want to listen to teachers who aren’t afraid of getting deep in to analytical discussions. In fact, they’ve much happier to listen to logical teaching than something that resonates on an emotional level. Why Are Some INTPs Christians? What I really like about Christianity is that rather than trying to do something impossible and achieve perfection to reach God, I want to do my best simply because he has already reached me. Similarly, I like that where I fail to feel close to other human beings, there is always God, so I’m not really alone. It is this sense of having him around that was my first proof of his existence. Apryl: I’m a Christian because I can’t not be. It doesn’t make sense. There is order in the universe, the system is complex, and because of this, there must be an Author. I want to know that Author, to tap into his creative intellect, to know the whys and the hows of it all. I have to know! I believe that Christianity is the right faith because it puts me into the most proper position in relation to the Author and His creation. It makes sense to me, and when my intellect is satisfied, I’m at peace. ms4runr: As for why I am a Christian, I answered a call, one that went straight to my heart and soul, one that changed my life dramatically and permanently. There have been challenges, but the experience of knowing the true God leaves any other belief in the dark. I see a big picture of how God is working. Nothing else answers the dilemma, nor solution, for mankind. kittyess: When I look at the world around me and ponder what I’ve learned in my advanced studies in science, I can only conclude that there must be a Creator. The ways God has reached out to me and shown His love and faithfulness in my life are what draws my heart to Him, and are why I believe that the Creator is a loving God who wants to know me and be known in return. Ralph: When I compare Christian faith with Islam: Allah cannot love, but love himself, because he had no object to love before creation. God Father, Son and Holy Spirit is love from the beginning. Your turn! 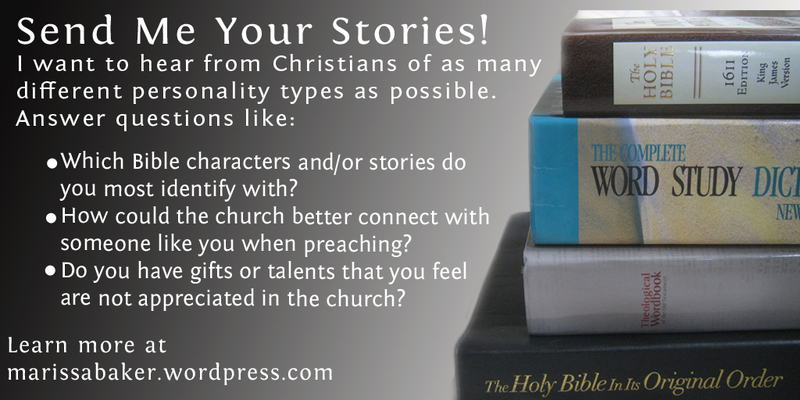 If you want to share your Christian INTP story or talk about INTPs in the churches, comment here! 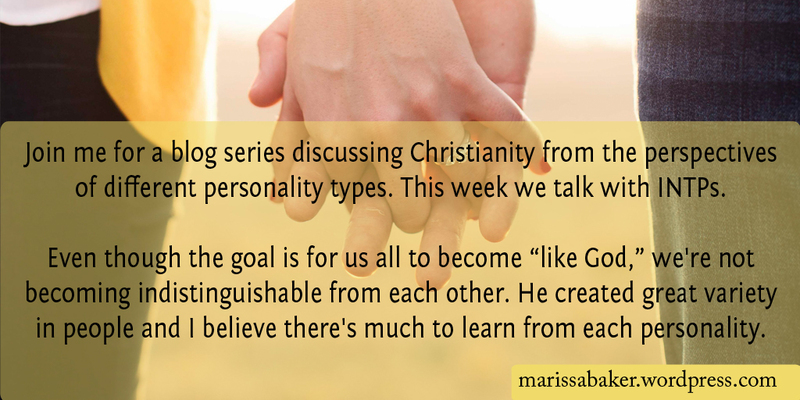 And if you’re a different personality type looking to contribute an upcoming blog post in this series contact me or head over to the original post. I’d love to feature you! Please note: unless you tell me otherwise, I’ll assume that by getting in touch you agree I can quote you directly and credit you by first name (or screen name) and Myers-Briggs type in future projects. Thanks particularly to the INTPs who shared *why* they believe. I see my own experience in all responses, and that feels really validating and encouraging. I don’t go to church, sadly, and I don’t plan to. I livestream/download sermons from a couple of churches online that have teachings that resonate with me and feed me, and I consider that going to church. The fellowship component, which is the only reason to attend a brick-and-mortar building, is always lacking. Phony people, pretending to be spiritual, pretending to care, prying into everyone else’s personal life… it just doesn’t work for me. In those settings, I end up being standoffish and quiet, which probably comes off as cold and aloof. Thank you for commenting! I’m glad you like the post and that it was encouraging for you. I really wanted to help give NTP Christians a voice and show they actually do exist. Part of me wondered if anyone would be envious of the people with INTP pastors — it does seem like an ideal situation for NT type Christians! Love this post!! I stumbled upon your “Here’s what your MBTI type can and can’t tell you” from SPASIGMA”s FB page, and I’m so glad I did. 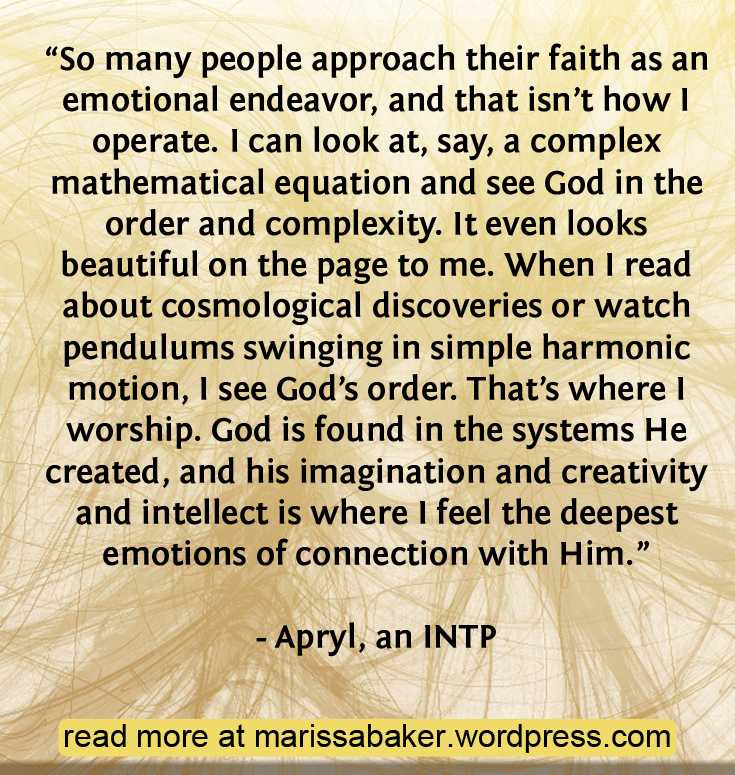 I’m also a Christian INTP! I have been a Christian for a while and a leader in churches for most of that time (mainly because it is hard to follow poor leaders). But I am currently out of church and struggling because I want more than an intellectual relationship with God and others. I know that sounds strange coming from an INTP, but I’m becoming aware that a lot of my relationships fail because I get stuck in my head, and my heart never engages. Others feel neglected or hurt, and all I have is regrets when they pull away, and I can’t follow. I also struggle from that subtle INTP flaw of decision paralysis. Unless I can make perfect choices or speak ideal words (and time doesn’t usually allow for enough analysis to get there), then I do nothing (lack initiative) or say nothing (lack sociability). I want my relationship with the Lord to be so intimate that He can whisper in my ear what to do or to say that will bless and love people. But even with Him, I am stuck in my head, when He wants to abide in my heart–and my heart is a foreign, unfamiliar, unapproachable stranger to me. I loved this! Unfortunately, I read this too late to submit my story, but then so many of what they said actually fits what I’ve experienced. I have a hard time going to, or finding a church, that preaches at my preferred depth. Most of what I find its not very deep, but emotionally driven or surface theology. Things that I’ve already researched on my own. Than it gets harder when they start saying, ‘you need to get involved in the church’, but I often think to myself ‘how can I get involved if you are not meeting my needs?’ I get most of what I need from podcasts and stuff, and the fellowship I often struggle with because I prefer to get to know someone one on one and intimately, not surface things and oh, now we are hugging and telling each other the life stories….eeek. It’s been a struggle going to church, because I do want to get involved, but finding that one that speaks to me is almost impossible. I identified a lot with Apryl’s comment, that I can cook and love to, but would rather talk about doctrine and apologetics. Most women’s Bible Studies don’t interest me because it isn’t focused so much on that but how to be a good helpmeet (or something similar). And the expectation to teach is often at a kid’s level, which kids do exhaust me. I can do it, but prefer to teach at an older level where people can understand the doctrine. Unfortunately most churches, not all though, I would have to be there for a while in order to even start teaching at that level. And with the level they preach at, and how they meet my needs, I know I am not going to be there that long. I will admit that I have been drawn more and more to the Reformed tradition because they are so academically minded, and have already explored the things I have been looking into, and at a depth that I can appreciate. And they do seem to appreciate my desire to teach theology, and can understand the level of theology I am teaching. I wanted to say that the Bible person I most connected with was the Apostle John. I love his gospel and the things shared through it, how deep the theology is. (and now that I learned Greek I appreciate it more for its easy Greek) Yet I also love the connection he has with Jesus. He is not as often in the limelight as Peter, but you always see him close to Jesus. He is even there leaning, or sitting, next to Jesus at the Last Supper. He was the only one that went and watched the crucifixion close up. John speaks to me, because he does have those moments when he acts up, but yet I find that close one on one connection with Jesus compelling. And the cool thing is that Jesus meets him on that connection and shares it! I sometimes wonder if Jesus and John spent some time alone and just speaking together on deeper issues, or just spent alone time enjoying the solitude and recharging from their day. I was told once that John is able to balance theology and love, and it is hard to find that balance when believers tend to focus too much on one and leave out the other. Or vice-versa. I know that is a struggle for myself, and it is something that I strive to do. As far as why I believe, they matched pretty spot on. Why wouldn’t I believe? Jesus says he is the truth, and that’s the start of Christianity. Its not based on some mystical and mysterious spiritual experience, or because someone told you and you must obey, but it is based on facts and logic, and even better a close one on one relationship with the supreme rational being. It’s true that I had a personal, spiritual experience to start with where God touched me and I came alive, but the more I dig into it I find such rationality and wonder that I can’t help but dig deeper and deeper. And one thing for certain, because God has such a depth and richness, that I won’t ever feel bored, or finished with seeking. Sorry for such a long post, but I really wanted to share my story, and how much this touched me. So, thank you! This is outstanding! I grew up in a fundamental church environment and reviled the groupthink mentality that seems pervasive in most churches. At 8 years old, I asked my Sunday school teacher “why do you believe what you believe?” Her response was “the bible says it’s true.” The other kids laughed at my question and agreed with her “obvious” answer. At 8 years old, I just want to fit in so I shut up for 10 years, never asking another question. 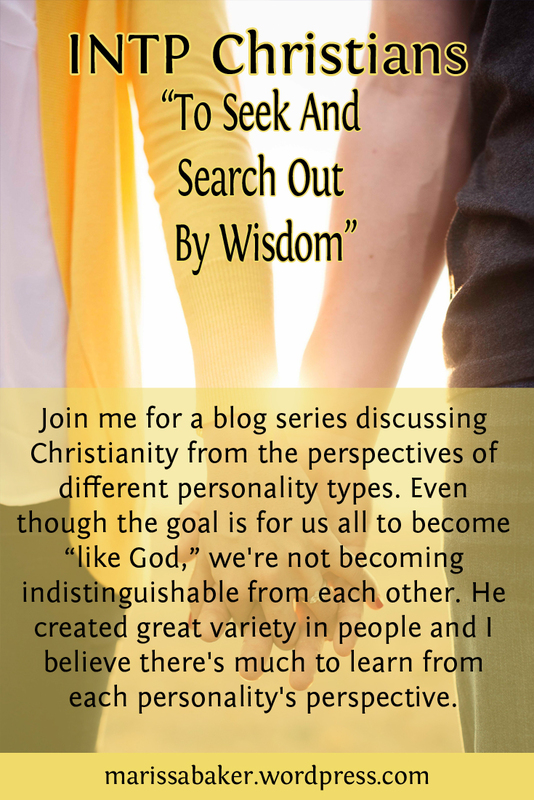 The questions I had became even more penetrating and I began observing more than engaging, trying to answer questions like “How do we know the bible is true?” or “Why are we here in the first place?” When I started college, I tried defending my “faith” on the grounds of what I was raised to believe, but the people I “witnessed” to had the same questions I did! It was time for me to start asking real questions to those more learned than myself about our faith. I spoke with 10 pastors of different denominations through those years and came to the conclusion that no one really knows anything about their faith other than the platitude: the bible tells me so. At 22, I was a professing Buddhist after reading “The Miracle of Mindfulness” by Thic Nat Han. I walked away defeated by reason and logic that no Christian could reasonably argue against. For 13 years, I “played” church to appease my family, but I never stopped learning and debating the ideas. I took a history of Christianity class, studied apologetics, read numerous atheists and Christian authors to gain a better understanding of the subject. I’m far from an expert in the field. I couldn’t connect with anyone for the very same reasons my fellow INTPs mention here. My existential crisis at 36 compelled me to make a decision, so I chose Jesus, based on the evidence I see about the authenticity of the 4 gospels. Nihilism doesn’t explain our existence, if it were true however, we have absolutely no reason to continue existing and procreation is an exercise in futility. Kierkegaard has been instrumental with my building a real faith. Delving into philosophy and reason, I started to learn why Christianity has made such an impact on the world. God makes sense, Jesus makes sense, existence makes sense! There is nothing wrong with how God made me! I am equally valuable to Him as everyone else. God wants us to ask questions. These revelations have ignited my heart! Wow! I have fellow INTP brothers and sisters! I echo most, if not all, of the experiences mentioned in the article and the comments. God has taught me a lot of things. I am attending worship services now because God has showed me that the verse in Hebrews 10:25 telling us not to neglect meeting together is not merely for socialization, but its more on our accountability for our brothers and sisters in Christ. I have now a genuine concern for the spiritual growth of my brothers and sisters, not merely on my own. I still hear shallow preachings every now and then, but now, instead of complaining about it, I lay it down to the Lord in prayer. And I see that God is moving. Like God is putting me into situations where I could express my thoughts and tell what God has taught me. And they’re listening! 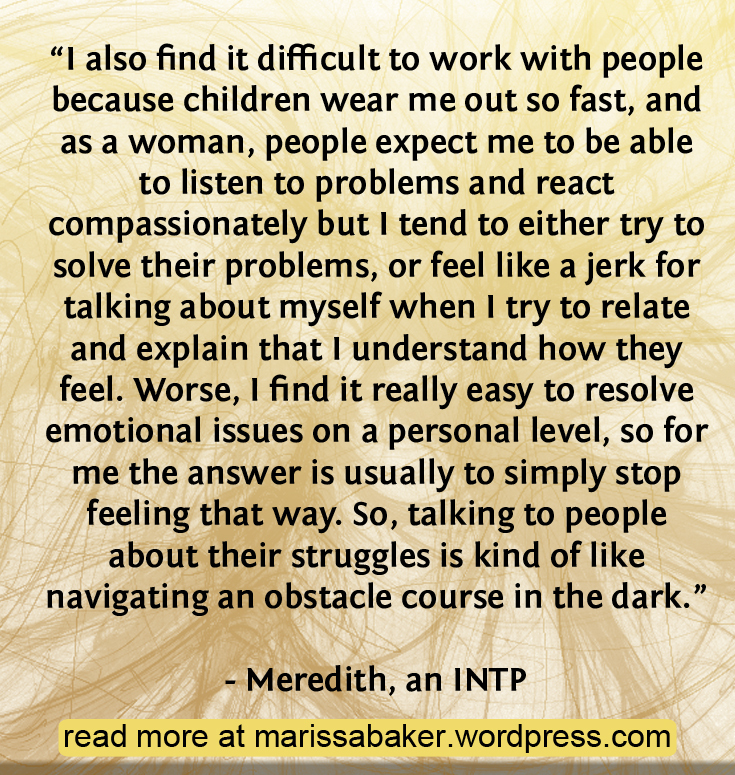 So to my fellow INTP’s, please do not lose heart. We can be the source of encouragement to others. I know it’s hard because, in the past, I have experienced to voice out my thoughts against something, but it was taken as an attack. But what we really want is just to express the truth. So I prayed that God would lead me to the right person that could effect change, where I could voice out my thoughts and not be taken as an attack. God does answer prayers. I’m an INTP and a follower of Christ. I am baffled to hear that INTPs are stereotyped to be the least religious personality type. Why is this so? Evidence of intelligent design is everywhere (Psalm 19:1)! The more I learn of science, the more I’m convinced that the universe did not spontaneously arise out of nothingness. To me, the existence of an all-powerful, benevolent God is the only rational conclusion. One can make a logical case for the veracity of the Bible and the Christian faith as well. It is heartening to hear the testimonials on this page from people who agree with this assessment. Isaac Newton and Blaise Pascal (both INTP’s) reached the same conclusion. gatherings. I care deeply about people, but I don’t like chit chat. I find that most people don’t like to analyze or question their own beliefs. For that reason, I do not talk about certain things with other believers. I believe that the Bible is the word of God. I also believe that the universe is billions of years old. These propositions are not mutually exclusive. You don’t have to give up your rational mind to become a Christian. A great resource for the technical-minded Christian is the website Reasons to Believe. I’ve never seen anyone give actual statistics or research to back-up their claim that INTPs are less religious than other types. I assume the idea comes from an assumption that faith can’t be rational (which, as you pointed out, is inaccurate). Thank you so much for commenting 🙂 I love hearing from people who agree that you don’t have to give up your rational mind to be a Christian. I sparsely ever contribute to online platforms of conversation, however, I found “Like An Anchor” (and particularly the pertinent post, “To Seek And Search Out By Wisdom: INTP Christians”) uncommonly edifying amidst the virtual milieu of Christian platforms of conversation; thus, in quite untypical fashion relative to my natural disposition, I felt enthusiastically obligated to contribute to the ongoing conversation herein. Moreover, and for sake of relevance, I am a Christian that is also incidentally identifiable with the INTP type; though I am given to a certain degree of reluctance (and perhaps even resistance) to be categorically designated as relatively anything else other than “Christian”. Nevertheless, I do currently perceive use of the framework of Myers-Briggs Type Indicator (MBTI) as somewhat beneficial within reason- though slightly the more beneficial: referencing the more technically oriented cognitive/psychological functions that form the conceptual basis of MBTI. Therefore, to a reasonable degree, do I refer to MBTI and the concomitant cognitive/psychological functions, and involve myself thus. Indeed, I implore all Christ followers to ultimately, always find their respective identities within Christ Jesus; furthermore, conceptual frameworks outside of The Holy Bible are not necessarily automatically anathema, but ever should they be considered in light of scripture, and in accordance with my own observation thus far, “Like An Anchor” has faithfully and inspirationally done such. Personally, I have considerably analyzed many of the various religions, philosophies, and sundry other modes of belief available within this current age of history, and I have found the logical eventuations of said distinct formulations of belief (as certain of which truly “boil down to” no matter how purportedly atheistic or agnostic)- to be utterly internally inconsistent, and such cannot possibly be veridical. Christianity is the only systematic of belief that is veridical: categorically, in accordance with my personal (near death) empirical encounter with God and likewise my considerably recurrent personal encounters with God’s voice and presence through the Holy Spirit- also, a few years of intense, frequent, and intellectually honest philosophical and theological rumination on the principles and outworkings of Christianity, and finally my objective observation of the unchanging historical, scientific, and philosophical veridicality thereof. No other systematic of belief (completely) withstands intellectually honest and intense analytical scrutiny relative to the categorically pertinent historical, scientific, and philosophical methodologies as Christianity does. Besides, one need not consider any other systematic of belief if they have discovered one (Christianity) that is veridical and logically flawless throughout even an approx. 2,000 year span; further, incredulous as a skeptic may be to, for instance, assert that there may yet be another systematic of belief that is veridical, that said individual would be guilty of faulty reasoning- for the truth is inherently singular and thus exclusive- truly, any certain systematic of belief is either true or false. If such a skeptic were to also then assert that the systematic of belief of Christianity is simply false, they would then be obligated to provide intellectually honest justification to prove the veridicality of such a claim, yet intellectually honest and logically consistent justification of the aforesaid claim has never been offered; throughout hundreds of arguments against Christianity, of which I have intensely observed and ruminated upon, none withstand logical, intellectually honest scrutiny. For instance, I have personally observed and ruminated upon many arguments and debates proffered by and participated within respectively, by the “New Atheists”: Richard Dawkins, Christopher Hitchens, Sam Harris, and Daniel Dennett; and they have thus individually and collectively evinced their philosophical and logical ineptitude by their incoherent and/or intellectually dishonest arguments. Even the more “sophisticated” atheistic thinkers throughout the history of philosophy, such as Bertrand Russell, Friedrich Nietzsche, or David Hume (sometimes rather considered such as a “religious naturalist” or agnostic, though nonetheless a pertinacious skeptic)- utterly failed to provide any logically coherent, definitive evidence of the supposed falsity of Christian belief; indeed, many such atheistic philosophers openly admitted to being completely unable to disprove Christianity. “When belief in God becomes difficult, the tendency is to turn away from Him; but in heaven’s name to what?” (G.K. Chesterton) For all of the anteceding reasons, and yet much abundantly more (of which I will not elucidate upon for sake of brevity- thus it is that this post a mere, minute snippet of my philosophical and theological thoughts and views)- do I intransigently believe and have a personal relationship with Jesus Christ, the one true God. Anyhow, and perhaps all the more relevant to the conversation at hand (I do earnestly apologize for my tangential proclivities)- I emphatically agree to the common points of observation and experience within this conversation; which seem to me to be (relative to Christian INTP’s): generally socially (and dispositionally) biased church culture, interpersonal superficiality within church fellowship; superficial, cursory, and perfunctory teaching, and finally certain “INTP-esque” struggles that (perhaps mostly, if not considerably) manifest by reason of the foregoing and to other related though less common points of observation and experience. Throughout all of the INTP responses within this conversation hitherto (to the point of my own response), when considered collectively, do I emphatically agree on almost every point offered forth; which, might I add, is exceptionally aberrant of me- perhaps a testament to a sort of empirical commonality inherent to Christians that are respectively categorically identified as INTP. Honestly, the aforementioned agreeance and mutuality of thought that I share with almost every other INTP herein, is the case to the point that I really have nothing fresh to offer relative to the “common points of observation and experience” categories I delineated above (which is, indeed, not intended to be extensive by any means). That being said, I shall hereafter simply comment on a few statements made, that for various reasons appealed to me to so comment on. Regarding the different comments made on Reformed churches, pastors, teaching, etc. The poster, “Mercy” said within her post: “I am a female Christian INTP and I find Reformed Baptist or Presbyterian pastors tend to preach the best sermons.” Honestly, from the hundreds of sermons I have witnessed in person and via other communicative means of viewing a sermon- I would have to agree: and for what justification thereof I currently do not know. Ironically, I am, in particular, neither Reformed Baptist nor Presbyterian in my theological stance; though, the number if things I am inclined to disagree with them about respectively is, overall theologically, very minimal. Moreover, Reformed Baptists theologically adhere to Calvinism (since they are theologically derivative of Particular Baptists); and I myself currently find Calvinism soteriologically incoherent in relation to scripture, chiefly because Calvinistic soteriology logically eventuates into theological/philosophical concepts such as determinism and double-predestination, of which in particular I find to be completely logically incompatible with scripture, as well as sound doctrine and theology. Presbyterians, on the other hand, may or may not necessarily theologically adhere to Reformed Theology depending upon the specific Presbyterian individual thereof within consideration (even though it is typically historically accepted that Presbyterians adhere to Reformed Theology), this definitively relates to whether the particular Presbyterian individual in question holds to the standards within the Westminster Confession of Faith (after The Holy Bible of course); which if they indeed do, they are essentially Reformed in their theology. It is crucial to indicate that there is significant discourse pertaining to: if one may actually be legitimately regarded as a Presbyterian if they reject the standards within the Westminster Confession of Faith, obviously given how fundamental the document is to Presbyterianism. The latest “season” of my life, I had engaged in a considerable study on the theological principles of Calvinism, endeavoring to determinately discover whether the theological systematic is true or not, and eventually did I (as I previously stated) stumble upon such theological/philosophical discrepancies relative to scripture, sound doctrine, and sound theology- such as determinism and double-predestination; as such, I am extremely skeptical of Calvinism, though I am always open to discussion and to being possibly convinced: admittedly, however, do I surmise that it would require strong logical substantiation (with likewise strong appeals to scripture and concomitantly theology) to convince me of donning the theological vesture of Calvinism. Slightly related to the previous matter, the poster “Elizabeth” said within her post: “I will admit that I have been drawn more and more to the Reformed tradition because they are so academically minded, and have already explored the things I have been looking into, and at a depth that I can appreciate. And they do seem to appreciate my desire to teach theology, and can understand the level of theology I am teaching.” Honestly, I agree wholeheartedly (and “whole-mindedly” of course); in fact, the academic mindedness of the Reformed tradition is basically exactly what compelled me to engage in research on Calvinism, as I was earnestly seeking to find good reason to become Reformed in my theology, even simply due to that academically minded nature typical of Reformed tradition. Now, whether the foregoing academic mindedness is universal to Reformed tradition (conflicting Arminianism pun intended- no, I am in fact not Arminian), I must say, it convincingly seems the case that it is. I must also clarify, that I have nothing personally against any Reformed individual or group thereof, in fact, I have been edified by the sermons of different pastors/teachers that identify as Reformed which I listen to frequently, such as John Piper (my favorite Reformed pastor/teacher)- I simply ignore the markedly Calvinistic information. Effectively, the conclusion of my post has finally come to fruition. Once more, I apologize for my tangential proclivities, and the Homeric proportions of my post; also once more, thank you very much “Like An Anchor” and Marissa for the great, edifying content. May the Lord’s face shine upon you all. I loved reading through this whole thing and I really appreciate you taking the time to compile all the data. It was very insightful and gave me some great ideas on how to care spiritually for the INTP’s in my life.